5000062 Darth Maul is a promotional Star Wars set given away to visitors to the LEGO stand at the New York toy fair in February 2012. These figures were also distributed as contest participation prizes during Star Wars Days at LEGOLAND California on March 31 and April 1, 2012. 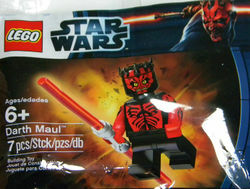 Darth Maul, in this set, has completely black legs. His torso is black but has printing on both sides depicting a grey-and-black belt and red printing depicting a bare chest. Maul's arms are red with black jagged marking on them, and his hands are red as well. Maul's head's base colour is black, but with red face markings, light green/yellow eyes, and sort of sand colored teeth markings, which help to create an angry expression. Maul's 'horn' piece is black with some red markings at the front that match his head markings. Maul, as also in Episode I, wields a double-bladed red lightsaber as his only weapon. After surviving the fight on Naboo, Darth Maul went to live on the Outer Rim with in a cave cybernetic spider-like legs. Over the years, Maul went mad, which caused him to forget certain events. However, his mind was restored by Mother Talzin, and prosthetic legs with a lower torso were fashioned for him. He then went with Savage Opress, his brother, to find Kenobi and engaged him in a duel, before Kenobi fled. Facts about "5000062 Darth Maul"